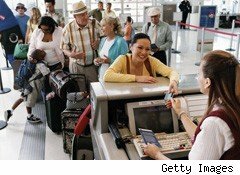 Some positive developments are on the horizon for America's beleaguered air travelers in 2011. I wish I could say that the changes will mean less crowded planes, more legroom in coach, and an easier experience in clearing security, but that's probably too much to wish for. Still, U.S. Transportation Secretary Ray LaHood seems intent on raising the bar for the treatment of airline passengers. Other new rules would give customers the right to cancel their ticket within 24 hours of making their reservation without a penalty, reimburse them for luggage fees when checked bags are lost or delayed and require airlines to announce flight delays within 30 minutes of receiving the information. Increased compensation for being bumped off a plane is another change likely to be implemented. Compensation would go up from the current $400 to a maximum of $650 for short delays in getting a passenger to their destination on another flight and from $800 to $1300 for longer delays. "Anyone who has flown before knows the stress and uncertainty that can accompany air travel," LaHood said recently in his blog. "By giving consumers more options, information, and most importantly, basic rights to fair treatment, we are trying to make air travel easier and more convenient for everyone." Airlines say they support many of the new rules, insisting they want to make things better for the traveling public and support transparency. But their opposition to some of proposed regulations is nothing short of ridiculous. For example, the Air Transport Association of America, the lobbying group for the major U.S. airlines, opposes mandating the reimbursement of checked bag fees if the bags are lost. "Bag fees are a competitive issue and whether a carrier chooses to refund a fee in all instances is a matter the marketplace should determine,'' the association wrote in response to the DOT's proposed regulations. The statement is an example of the arrogance of the airline industry: Any business focused on satisfying customers would give a refund for failing to deliver the service being paid for. It also isn't the smartest public relations strategy. The Obama administration seems to have grasped that embracing passenger rights in an environment of increasing customer dissatisfaction with air travel is a political no-brainer. LaHood proposed the new regulations designed to strengthen consumer protection for airline customers last June. However, given the bureaucratic federal rule-making process, the final regulations won't be announced until around April 15. Consumer advocates also deserve credit for the new regulations -- people like Kate Hanni, who was stuck with her family for nine hours on the tarmac on an American Airlines (AMR) flight without food or water in December 2006. Hanni funneled her frustration over the experience into a grassroots organization, FlyerRights.org, which was the group primarily responsible for the rules implemented in April 2009. The new rules fine airlines as much as $27,500 per passenger if they fail to allow passengers to disembark from a plane during tarmac delays of longer than three hours. The airline industry bitterly complained about those regulations too, saying they'd lead to large numbers of flight cancellations as airlines acted to avoid situations in which they would be fined for keeping a plane too long on the tarmac. That hasn't happened (except in the post-Christmas blizzard that slammed the East Coast and led to mass cancellations throughout the U.S). Instead, the drop in extended delays has been dramatic. Only 12 flights were delayed by more than three hours on the tarmac from May through September of this year, compared to 535 extended delays in the same period of 2009. The October 2010 data is even more extraordinary: No tarmac delays of more than three hours, down from 11 in 2009. Moreover, flight cancellations were reduced from 0.99% in October 2009 to 0.97% for October 2010, clearly showing the reduction in tarmac delays also did not come with the massive increase in cancellations the airline industry predicted. Transportation Department statistics show the number of plane cancellations has remained relatively stable between 2009 and 2010. Hanni said airlines need to learn that flyers have rights. "We really aren't against the airlines," Hanni told me in a recent phone conversation. "We are just trying to restore certain basic standards to travel." One of the biggest concerns of FlyerRights.org and other consumer groups is pricing transparency. Groups representing business travelers say corporations can't even figure out their travel budgets accurately because of the extra charges airlines have put on their pricing menu for a range of services from checking luggage to extra-legroom seats. A recent Transportation-commissioned analysis that was done in connection with the proposed new rules found that only one major airline, Delta (DAL), posted the total ticket price on the initial Web booking pages. Other airline sites made customers wait until they were about to enter their credit card numbers before they found out the total fee. Under the proposed regulations, not only airlines but travel booking sites such as Orbitz (OWW), Travelocity and Expedia (EXPE), would be forced to outline all charges for an airline ticket. Another proposed change would stop airlines from advertising teaser fares for one-way tickets that don't exist because you have to fly round-trip to get the discounted price. Transportation officials say this is a deceptive practice. Those rules can't come soon enough and hopefully will create a little more honesty, particularly in the case of Spirit Airlines, in my opinion the airlines industry's No. 1 offender when it comes to a poor pricing transparency. I should have known better when I signed up for Spirit's $1 fare special for a trip this past weekend from Fort Lauderdale to Orlando. The $1 fare quickly became around $60 unless you purchased a round-trip ticket, which wasn't disclosed on the website. So I booked a return trip even though I didn't want it, making sure it was on another day that the $1 fare was offered. After all, $2 wasn't bad for a round trip. Once taxes, fuel surcharges, security charges and other unidentified Spirit Airlines fees were calculated, I owed $55.40. It was still pretty good I thought, though far north of the $1 teaser rate. Then, after I entered my credit card information, I was taken to a new page on the website and asked if I wanted to prepay my luggage fee. At least I could skip that fee, I rationalized, since I was taking a carry-on bag. But no: Spirit charges $30 for carry-ons. Then there was a matter of the seat selection charge. You could get your seat for free, but only at the airport on the date of the flight. If you wanted to print out your boarding pass in advance, even for a middle seat, there was a $13 charge. More desirable aisle seats would cost me $20. I opted to get my ticket at the airport counter, even if I had to wait in line. I also quickly unchecked the $12 travel insurance box that the Spirit website had automatically signed me up for before agreeing to pay for my ticket. By unchecking that box, I was able to get down my fare to $85.40. Is There an Extra Fee for Good Customer Service? It will be interesting to see how the new regulations might effect Spirit's creative fare marketing on its website. The proposed transparency rule would prevent airlines from automatically singing you up for travel insurance and other optional features. My 40-minute Spirit flight this past Christmas weekend was uneventful, but I didn't find a copy of the airline's in-flight magazine in the seat pocket. Our flight attendant said the magazine was still published, but missing from our plane. Perhaps passengers were supposed to pay a $5 magazine charge on the website in advance of our flight. I was looking forward to reading a message in the magazine from Spirit Airlines CEO Ben Baldanza explaining why his airline has the fairest prices. Last time I had flown on Spirit a year earlier, the magazine included a lively explanation of how Spirit charged customers only for the add-ons they needed. Over the summer, Baldanza testified before Congress that having luggage was not essential for going on vacation, so the charge for carry-on luggage was actually an optional fee. At the end of the trip, the flight attendant thanked us for flying Spirit. He said he had hoped our experience was pleasant, but if it wasn't, he made it clear that Spirit wouldn't be hearing any complaints. If we weren't satisfied, he said, we could go to "southwest.com," to book our next trip.